The Danish naturalist Johan C. Fabricius (1745-1808) first described and named the Crossline Skipper in 1793 in the third volume of his Entomologia Systematica; he did so on the basis of a 1787 drawing by William Jones, one of several Jones did of specimens in the collection of the famous London naturalist Dru Drury (Calhoun 2009a). Drury’s specimen was probably collected about 1765 in the vicinity of Brooklyn, New York; it is now considered lost. Fabricius’s description was rather vague and general, leaving room for confusion with some other species (Miller and Brown 1981: N125). Subsequently, other early entomologists allied the Crossline with the Tawny-edged Skipper, then known as Hesperia themistocles, or with Hesperia cernes, a name given by Boisduval & LeConte to a species figured by John Abbot, which was probably a Tawny-Edged. When Thaddeus W. Harris wanted to identify two specimens he had in his insect collection about 1840, one from Massachusetts and one from Georgia sent by John Abbot, he first called them both Hesperia cernes, following Boisduval and Le Conte. Harris had collected his Massachusetts specimen on 20 July 1836 in Cambridge, Massachusetts (Harris Index; 1862: 316). Scudder then re-described Harris’ Massachusetts specimen, naming it Limochores manataaqua, the Cross Line Skipper, and pointing out that it was definitely not the same as H. cernes (Scudder, 1862). For nearly a century afterwards, the widespread North American Crossline Skipper was known by Scudder’s species name, manataaqua, commemorating a Native American-- although it is not clear which one. As Calhoun has pointed out (2009a), Harris’s Cambridge specimen, still in the MCZ at Harvard University, should be recognized as a “syntype” for H. manataaqua (in addition to Scudder’s specimens), and the “type locality” should be Cambridge, Massachusetts. The switch back to Fabricius’s name origenes was proposed by W. H. Evans of the British Museum in 1955. While perhaps not fully justified given the vagueness of the old description, and not popular among American entomologists, the name origenes did pre-date manataaqua, and it has been accepted for the last fifty years or so. Calhoun recommends its retention mainly on grounds of the need for nomenclatural stability. Scudder refers to at least ten Massachusetts specimens of Crossline Skipper, and though he does not generalize about its relative abundance, it appears to have been found at all the usual collecting locations. “It has been several times taken in the neighborhood of Boston (Merrill, Faxon, Guild, Sanborn, Scudder) and in the Connecticut valley at Springfield (Emery), Deerfield, Mt. Tom (Sprague), and Granby, Mass. (Sprague, Scudder) (1889: 1723-4).” F. H. Sprague found several in Milton (7/5/1887, MCZ), and also found it in Belchertown, Amherst and Montague (1878, 1886, and 1885). There are old specimens from Warwick from "Miss Edwards" (n.d.; MCZ). We may deduce that in the 19th century Crossline Skipper was probably, in the phrase of the time, “not uncommon” in the state. Like other upland skippers, it almost certainly benefited from land clearing for agriculture through the 18th and early 19th centuries (Table 1). Similarly, for Martha's Vineyard Jones and Kimball (1943) reported Crossline Skipper as "not abundant though well distributed"; but in contrast it was "general and common" on Nantucket. (Two F. M. Jones 1928 specimens from the Vineyard are at the Yale Peabody Museum; four "manataaqua" specimens are in the Kimball collection at the Maria Mitchell Museum on Nantucket.) On the islands the relative abundance of Crossline versus Tawny-edged was the reverse of that on the mainland, with Tawny-edged Skipper the less common, being only "occasional" on the Vineyard and not found at all on Nantucket. In ensuing years Crossline Skipper seems to have been somewhat overlooked. It apparently was considered fairly ordinary. For some unknown reason, between 1960 and 1966, major collector C. G. Oliver took an astounding 19 specimens of Crossline Skipper in West Action (Yale Peabody Museum). William D. Winter took a few specimens of Crossline Skipper in Westwood in 1966, 1972, and 1973 (Harvard MCZ). He also found it in Barre, Massachusetts on July 8, 1972, and Darryl Willis found Crossline “common” in June and July 1974 in the Holliston-Sherborn area, most likely along the Sherborn power line. (Lep Soc Seas. Sum. and Corresp. 1959-1981). In what may have been the first documentation for Berkshire County, O. R. Taylor found a specimen of Crossline Skipper in Richmond on 8 July 1962 (Yale Peabody Museum). Crossline is one of the six dry land skippers discussed in the Leonard’s Skipper and Indian Skipper species accounts (Table A), but it is one of two which are possibly a bit more common today than at the turn of the century. It has a large range throughout the southeast down to the Gulf Coast, and west to the Rockies. It has two broods south of Philadelphia, but only one in Massachusetts. It visits a wide variety of nectar sources. As a Polites skipper, Crossline is closely related to the Tawny-edged Skipper, as well as to Long Dash and Peck’s, and is sometimes found in the same areas, but in general Crossline is more confined to dry habitats than any of these (see Cech 2005 for exceptions). Shapiro (1974) describes Crossline as “less ecologically tolerant” than Tawny-edged in New York state, occurring often in sandy soil areas and dry meadows. R. Walton and C. Leahy in the 1986-90 MAS Atlas describe typical Crossline habitats in Massachusetts as old fields, power lines, and sand barrens. The 1995-99 Connecticut Atlas observed Crossline Skipper ovipositing on little bluestem (Schizacyhrium scoparium) in the wild. Purpletop (Tridens flavus) and little bluestem are the only two grasses known to be used by Crossline Skipper in the wild (Scott 1986), although it accepts other grasses (e.g. Kentucky bluegrass) in the laboratory. Tridens flavus (“purpletop,” or “tall red top”) is a native North American grass, found only in upland areas. It may have had a more southerly distribution in pre-settlement times, since Sorrie and Somers list it as “introduced” into the majority of Massachusetts counties. Scudder was reasonably familiar with the life history of Crossline Skipper (see below under Broods), since he raised numerous caterpillars collected from “around Cambridge,” where he found the eggs on “ordinary grasses” (1889: 1724). Both MBC and Atlas records rank Crossline Skipper as “Uncommon” (Table 5). Both sources also find Crossline somewhat less abundant than Tawny-edged Skipper, which is “Uncommon-to-Common.” Crossline ranks about on a par with Cobweb, Indian and Leonard’s in abundance, but is less common than Tawny-edged, Long Dash and Dusted Skippers. Crossline is sometimes hard to identify in the field, and females are difficult to distinguish from Tawny-edged females dorsally (from above). Thus there may be some underreporting of Crossline. Although this species may be more somewhat more common now than in Scudder’s time, MBC sightings per total trip reports (Chart 94) do not show any strong trend either upward or downward. However, list-length analysis of MBC 1992-2010 data found a statistically significant 48.1% decline for Crossline Skipper (Breed et al. 2012). This is unlike the upward trend for Tawny-edged Skipper, the strong upward trend for Dusted Skipper, and is similar to the downward trends for Leonard’s, Cobweb and Indian Skippers (Table A). The high reading in 1993 on the chart is somewhat unusual. It results from an especially large number (43) reported from the 7/11/93 Foxboro NABA Count, which was not repeated or approached in subsequent years on that Count, nor did other NABA Counts that year report unusual numbers. The only larger single location count in the database is from the Martha’s Vineyard NABA Count on 7/16/2005, which found 49 Crossline Skippers. Crossline Skipper is widely distributed across the state, although sparse in many areas. The greatest numbers are seen in the drier habitats, especially Cape Cod and Martha’s Vineyard. As Map 94 shows, Crossline Skipper was found in 99 out of the 351 towns in the state, whereas Tawny-edged Skipper, noted above as the more common of the two, was found in 153 towns during this same time period. 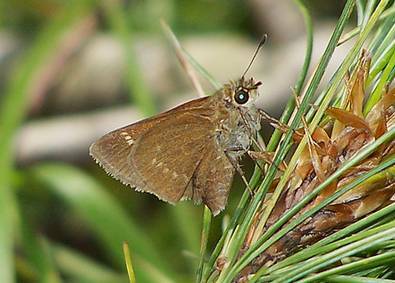 Leonard’s and Indian Skippers were similar to Crossline, being found in 85 and 92 towns respectively, while Cobweb Skipper was the least common, having been found in only 57 of the 351 towns in the state through 2013. For Nantucket, there are two reports of Crossline Skipper from Tuckernuck, 2005 and especially 11 on 7/2/2011, M. Pelikan, indicating that the species continues its historical presence there (see also LoPresti 2011). For Martha's Vineyard, Crossline has been reported almost every year on the Vineyard NABA Count since its inception in 1999, with high numbers of 49 on 7/16/2005 and 19 on 7/20/2013. Aside from the Count, it is usually reported from the island every year, e.g. Oak Bluffs, 19 on 7/113/2005, M. Pelikan; Tisbury, 15 on 7/16/2004, A. Keith; West Tisbury Old County Rd.,7 on 6/28/2001, M. Pelikan; and State Forest, 7 on 7/1/2010, M. Pelikan, even though the NABA Count was rained out that year. In Berkshire County, the 1986-90 Atlas had only one record, but Crossline Skipper has since been reported regularly in small numbers on the Central Berkshire NABA Count centered in Pittsfield (e.g. 13 on 7/20/2013, and in most years on the Northern Berkshire count centered in North Adams (e.g. 9 on 7/13/2013), and in some years on the Southern Berkshire Count centered in Sheffield. Still, it is scarce in Berkshire County. It has been reported regularly in strong numbers from the Central Franklin, Northern Worcester County, Blackstone Valley, Foxborough, and Martha’s Vineyard NABA Counts. It is often found on the Falmouth, Truro and Brewster NABA Counts on Cape Cod. Mello and Hansen (2004) mention Fort Hill, Crane WMA, and Cape Cod Airport as three fairly reliable locations on Cape Cod. Acton Ft. Pond Brook, 4 on 7/21/2002, E. Nielsen; Belchertown Quabbin Park, 2 on 6/25/2010, R. and S. Cloutier; Burlington Mary Cummings Park, 5 on 7/16/2011 B. Bowker; Canton Great Blue Hill, 17 on 7/15/2007 E. Nielsen; Carver Myles Standish SF, 50,“abundant” on 6/27/2010 M. Arey; Charlton power line, 6 on 7/19/2011 B. Bowker; Chelmsford power line, 9 on 7/28-30/2011 B. Bowker; Duxbury Bay Farm, 6 on 8/19/2011 B. Bowker and L. Stilwell; East Longmeadow Parker yard, 10 on 8/1/2009 K. Parker; Edgartown Edgartown SF, 9 on 7/9/2011 M Pelikan; Harvard Oxbow NWR, 3 on 8/3/2003 T. Murray; Hopedale Draper Park, 5 on 7/21/2000 R. Hildreth; Mansfield ,26 on 7/27/1997 R. Hildreth; Milford, 6 7/12/1999 R. Hildreth; Monson Norcross WS, 3 on 6/28/2012, E. Barry et al. ; Montague, 5 on 7/6/2013, T. Gagnon et al. ; Nantucket Tuckernuck, 11 on 7/2/2011 M. Pelikan; Pittsfield, 4 on 7/20/2013, B. Benner and J. Wicinski; Truro/Provincetown, 9 on 7/7/2012, A. Robb and T. Hansen; Upton Robertson's Gas Line, 10 on 7/4/1999 T. and C. Dodd; Wellfleet Wellfleet Bay WS, 15 on 7/27/2009 M. Faherty; Woburn Horn Pond Mtn., 4 on 6/29/2013, H. Hoople et al. ; Worcester Broad Meadow Brook WS, 6 on 7/10/2001 G. Howe; Yarmouth Dennis Greenough Ponds, 3 on 7/14/2013, J. Dwelly. According to MBC records, Crossline Skipper's flight time statewide stretches from the first week in June through the last week in August. The largest numbers are seen in the first three weeks of July, with much smaller numbers seen before and after that (http://www.naba.org/chapters/nabambc/flight-dates-chart.asp). Crossline has only one brood at our latitude, but two broods south of Philadelphia. Its adult flight falls largely between the two flights of Tawny-edged. Earliest sightings: In the 22 years of BOM-MBC records 1992-2013, the six earliest "first sightings" are 5/28/2013 Newburyport, B. Zaremba (http://www.pbase.com/bo_z/crossline_skipper_series); 6/6/2004 Famouth Crane WMA, A. Robb; 6/6/2007 Amherst Amity Place, F. Model; 6/10/2008 W. Tisbury Wakosim, M. Pelikan; 6/10/2001 Hingham, D. Peacock; and 6/10/2000 Westwood Hale Res., E. Nielsen. There is no effect seen here of the very warm springs and summers of 2010 and 2012, but it is likely that in the years 2009 - 2013 observers were simply not catching the earliest appearance of this hard-to-identify skipper. Still, these reports are much earlier than the Atlas early date of 6/29/1986 Petersham, J. Baird. Scudder was familiar with the life history timing of Crossline Skipper, because he was concerned to differentiate it from the more-common Tawny-Edged, with which it was sometimes confused. His description is derived from the raising of eggs and larvae which he found around Cambridge, Massachusetts (a town where this skipper cannot be found today). He writes that this species “makes its appearance in the imago [adult] state the very last of June, occasionally as early as the 22nd, by the 7th of July it becomes abundant..." (1889: 1724). Today's first sightings are usually much earlier, suggesting some flight time advancement by this skipper. In eight (one-third) of the 22 years 1992-2013, the first sightings have been in the first three weeks of June (6/1-6/21), prior to Scudder's earliest date. Latest sightings: In the same 22 years under review, the four latest "last sightings" are 8/29/2004 Barnstable Long Pasture, S. Moore and B. Volkle; 8/28/2009 Lexington Dunback Meadow, B. Bowker; 8/25/2000 Sherborn, R. Hildreth; and 8/22/1996 Milford, R. Hildreth. Again, observers in recent years (2010-2013) are probably not catching the latest flight dates. Still, BOM-MBC dates are later than the Atlas late date of 8/10/1986 Sharon, B. Cassie. Today's last sighting dates are similar to Scudder's, and there seems to be no sign of a partial second brood flying in September. 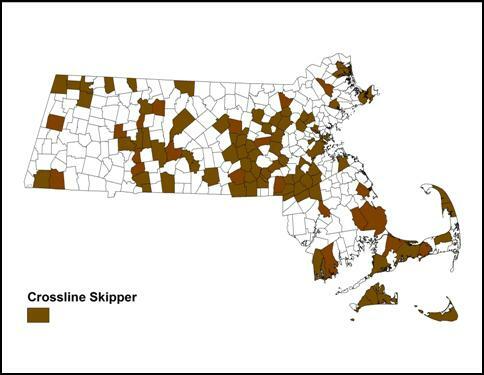 More systematic observations are needed on what habitats and host grasses Crossline Skipper uses, both in Massachusetts and throughout its large range. Given this range—from Canada to Florida and Texas--- and its bivoltine adaptation, this skipper is less likely than others to be adversely affected by climate change in Massachusetts (Table 6). It may even become more common, and should be watched for evidence of a partial second brood. Crossline Skipper is ranked S4 or “apparently secure” in Massachusetts by NatureServe (2010). It is similarly ranked in Connecticut, New Hampshire, Maine and New Jersey.